Like so many other Newfoundlanders, Machel Rayner had to leave the province for work. It was September and the personal trainer had accomplished a goal of his own: He received permanent residency in Newfoundland and Labrador, the province he has called home for eight years. However, there was one more thing he had to do. Rayner needed to find a good-paying job, one that could support him, his two younger siblings and his mother back in his home country of Jamaica. But that one move — temporarily relocating to Halifax for work — put him at odds with the rules of the Newfoundland and Labrador government immigration program, which insisted that he stay put inside the province. The expulsion threw his life, and the lives of his family, into flux. “I was distraught. I was weak in the knees,” Rayner, 31, said in an interview Wednesday. Nearly a decade ago, while working at a Sandals resort in Jamaica, Rayner was approached by a couple from Newfoundland who sold their province as a place where the charismatic Rayner could live and thrive. Intrigued, he applied to do his undergrad at Memorial University and was accepted. The province upheld all his expectations, he said. “Everyone here is friendly. They go out and beyond to make sure that I’m comfortable here,” he said. Rayner’s contagious laughter, positive outlook and big smile caught the attention of CBC cameras in 2011 while he was working behind the counter at Tim Hortons at the Aquarena in St. John’s. He would sing and dance for customers to brighten their day. After completing his degree in kinesiology at MUN, Rayner brought his positive outlook to the gym, where he sang and danced for clients looking to improve their physical fitness. He was “living the Newfoundland dream,” taking chilly walks along the edge of the North Atlantic with his Newfoundland dog Jam Jam, and giving a hearty nod and “whattaya at, b’y?” to anyone who passed by. But after his employer cut one of the fitness programs, Rayner taught at a local gym, and he suddenly found himself losing out on $10,000 a year — or about 25 per cent of his annual income. “With that reduction in income, I was financially stifled. I couldn’t meet my bills with my regular livelihood and also take care of my diabetic mom back home,” Rayner said. 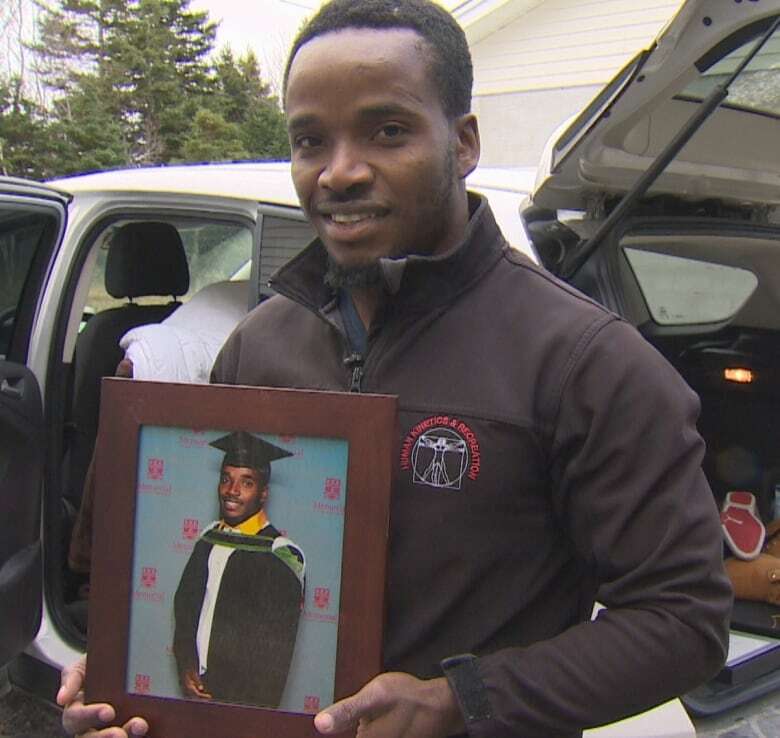 Rayner had already saved enough money to bring his younger brother Shaquille, 23, to the province, where he’s currently studying to be an electrical engineer at the College of the North Atlantic. His youngest brother, who is 21, is set to arrive next year. Rayner needed to find money to fulfil the wish he made his mother eight years earlier to get his little brothers to Canada. He didn’t have any luck securing a higher-paying job in Newfoundland, but Rayner did get an offer in Halifax. “I was hesitant in going because Newfoundland is home,” Rayner said. By leaving the province for work — albeit temporarily — Rayner said he was automatically removed from the Newfoundland and Labrador Provincial Nominee Program. While it wouldn’t discuss the case, the Department of Advanced Education, Skills and Labour said that the Canada-Newfoundland and Labrador Immigration Agreement requires immigrants to live and work in this province as they pursue permanent residency. The certificate is granted to people who have skills that the province can use to address specific economic development and labour market needs. Federal immigration and refugee protection regulations require that people “must intend to reside” in the province that nominated them. Without the program, Rayner either has to leave the country voluntarily within two weeks and start the process over again or appeal — and run the risk of being banned from Canada for a minimum of one year. The appeal hearing is too risky, Rayner said. Instead, he is leaving his younger brother, his fitness clients and dog behind. If Rayner was told about the stipulation, it simply slipped his mind, he said, adding he originally applied for his residency three and a half years ago. On Wednesday, Rayner and his brother Shaquille packed a small storage unit in St. John’s full of Rayner’s things. His framed diploma from Memorial University perched atop a pile of possessions collected over eight years. Working two jobs and seven courses, Shaquille will shoulder the family financial burden — for now. “All my mom has been doing is praying that I don’t return [to Jamaica] and that there’s some sympathy,” Rayner said. In recent years, the Newfoundland and Labrador government has put a big push on immigration. With more citizens dying than being born, the population is dwindling and is in desperate need of a boost. A provincial Liberal immigration action plan released last year indicated the province has a “roadmap” to welcoming 1,700 newcomers annually by 2022. Now, one of their longtime residents is leaving. Rayner may have worked on the beach at a Sandals resort, but he grew up in one of Jamaica’s toughest neighbourhoods: Trench Town in the capital of Kingston. He doesn’t know how long reapplying to come back to Newfoundland will take or if he’ll ever be allowed back, but remains his upbeat, optimistic self. He’s not jaded by his experience. Nor does he blame the province. The Department of Advanced Education, Skills and Labour did not accept CBC’s offer for an interview with the minister, citing privacy concerns over discussing specific cases.